A chess engine is an application which is capable of playing chess and uses a standard protocol to communicate with an external Graphical User Interface (GUI). 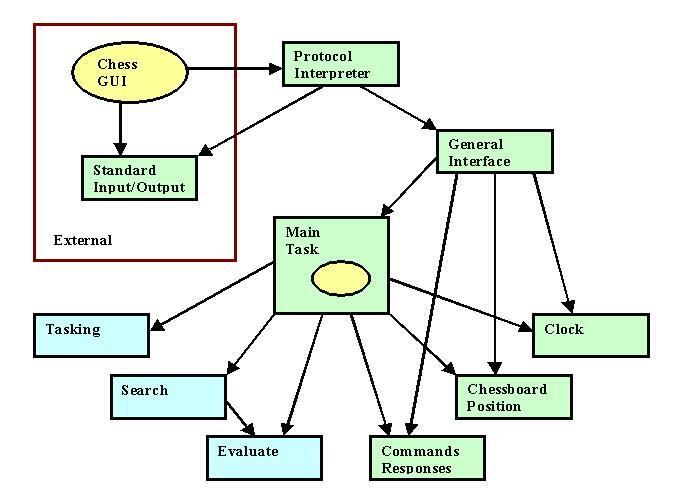 In both protocols the chess engine is an executable which is started by the GUI and which exchanges plain text commands with the GUI through its standard input and output. 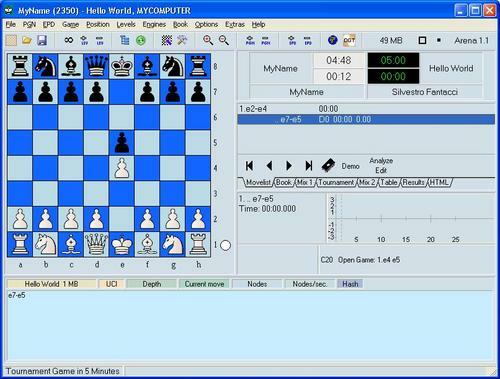 // "go wtime 300000 btime 300000 winc 0 binc 0"
The Chess GUI runs the Chess Engine executable. The Chess Engine main function - which is located in the Protocol Interpreter - is called. The General Interface calls the Start method in Main Task. The Main Task uses the Tasking functions to create and launch its Task (thread). The Task starts its first cycle, suspending on Commands/Responses. The Chess GUI sends the "uci" string to the Chess Engine. The Protocol Interpreter sets itself up to support the Universal Chess Interface. The Protocol Interpreter has a function UCI-Send-Move (Move) which sends the "bestmove <Notation>" string to the Chess GUI, where <Notation> is the algebraic notation returned by the specified object of class Move. The Protocol Interpreter requests the General Interface to use the UCI-Send-Move (Move) function. The General Interface forwards the request to Commands/Responses. The Protocol Interpreter gets the <Engine Name> and <Engine Version> information from the General Interface, constructs the string "id name <Engine Name> <Engine Version>" and sends it to the Chess GUI. The Protocol Interpreter gets the <Author’s Name> information from the General Interface, constructs the string "id author <Author’s Name>" and sends it to the Chess GUI. The Protocol Interpreter sends the "uciok" string to the Chess GUI. The Chess GUI sends the "isready" string to the Chess Engine. The Protocol Interpreter calls the Wait-Until-Ready method in the General Interface. The General Interface checks the Main Task status in the Commands/Responses module. The status is ready, hence the General Interface returns from the call. The Protocol Interpreter sends the "readyok" string to the Chess GUI. The Chess GUI sends the "ucinewgame" string to the Chess Engine. The Chess GUI sends the "position startpos moves e2e4" string to the Chess Engine. The Protocol Interpreter parses "position startpos". The Protocol Interpreter calls the Set-Initial-Position method in the General Interface. The General Interface calls the Reset method in Chessboard Position. The Protocol Interpreter parses "moves". The Protocol Interpreter parses "e2e4" and converts it to an object of class Move. The Protocol Interpreter calls the Apply-Move (Move) method in the General Interface. The General Interface calls the Apply-Move (Move) method in Chessboard Position. The Chess GUI sends the "go wtime 300000 btime 300000 winc 0 binc 0" string to the Chess Engine. The Protocol Interpreter parses "go". The Protocol Interpreter parses "wtime 300000" and converts "300000" to an object of class Time representing 5 minutes. The Protocol Interpreter calls the Set-Total-Time (White-Player, Time) in the General Interface. The General Interface calls the Set-Total-Time (White-Player, Time) in Clock. The Protocol Interpreter parses "btime 300000" and does likewise with Black-Player. The Protocol Interpreter parses "winc 0" and calls the Set-No-Intermediate-Time-Control (White-Player) in the General Interface. The General Interface calls the Set-No-Intermediate-Time-Control (White-Player) in Clock. The Protocol Interpreter parses "binc 0" and does likewise with Black-Player. The Protocol Interpreter calls the Start-Engine method in the General Interface. The General Interface releases the Task suspended on Commands/Responses. The Protocol Interpreter suspends on the standard input, waiting for the next command from the Chess GUI. Task reads from Chessboard Position whether it is requested to play a White or a Black player’s move. Task reads from Clock how much time is left and decides how much time to spend searching for the best move. Task initialises Search using Chessboard Position. Task starts cycling, at each cycle progressing Search a little bit further and then checking whether the time to spend on it is over. Search constructs a forward search tree whose nodes represent chess positions and whose links represent chess moves, expanding the most promising branches according to Evaluate. The Search class is actually a generic class with parameters Nodes, Links, Figure-of-Merit (Node), etc… that Task instantiates appropriately. Evaluate statically examines a chess position and returns a real number indicating how good the position appears to be. When the search time is over, Task reads from Search the most promising move and calls Send-Move (Move) in the Commands/Responses. This triggers a call to UCI-Send-Move (Move) and the "bestmove <Notation>" string to be sent to the Chess GUI.